Reasonably new on the pet food scene is the Symply range of foods - the company are based in Bucks and previously imported a US brand of food which it distributed in the UK. They sell a range of foods in dry and wet form, and seem to be aimed at the more expensive end of the market. 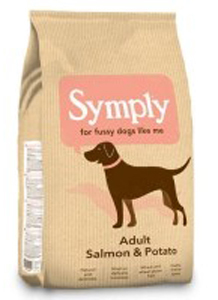 Symply foods fit easily into the 'natural' sector of the pet food market. They are available from independent pet shops. They are however very expensive when compared to alternative brands offering similar products. Expect to pay £49 - £51 for a 12kg sack, which makes this around twice the price of some similar products, and difficult to recommend based purely on price, even when the product is good. Tray foods are available at around £1.59 for 395g which is almost twice the price of Naturediet, an excellent alternative.